I love food you can dip bread into. Like big saucy bowls of pasta. Or warming soups. Or big steaming plates of moules. 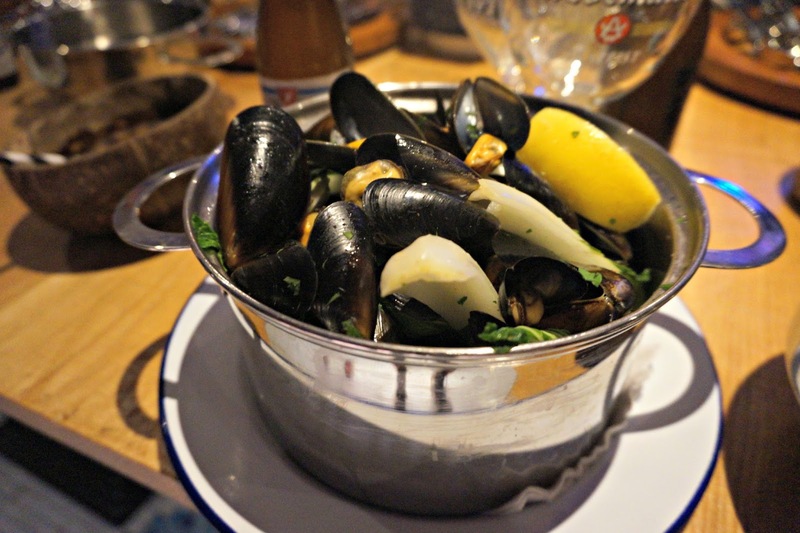 And moules is exactly what grabbed my attention when an invite from Belgo dropped into my inbox. 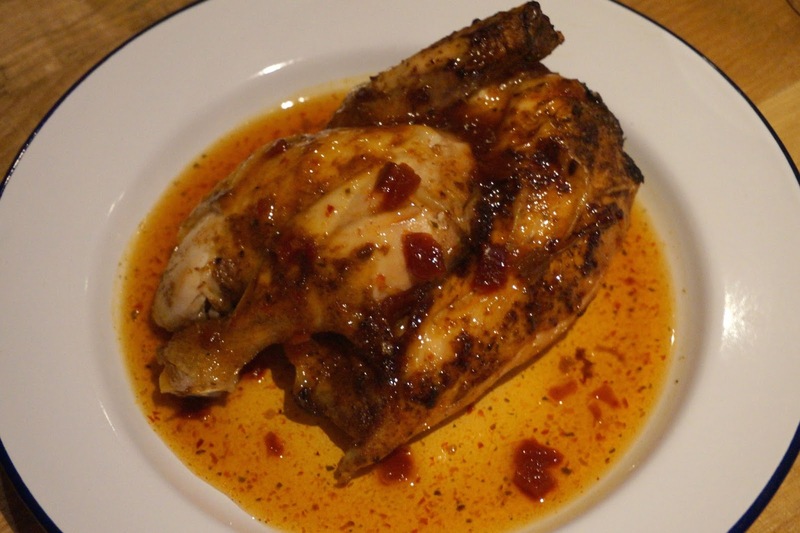 I'm sure you'll have walked past a Belgo before. There are 5 propped up across London. You might even have been and eaten there yourself but if you haven't, don't worry as I'm going to give you the low-down. 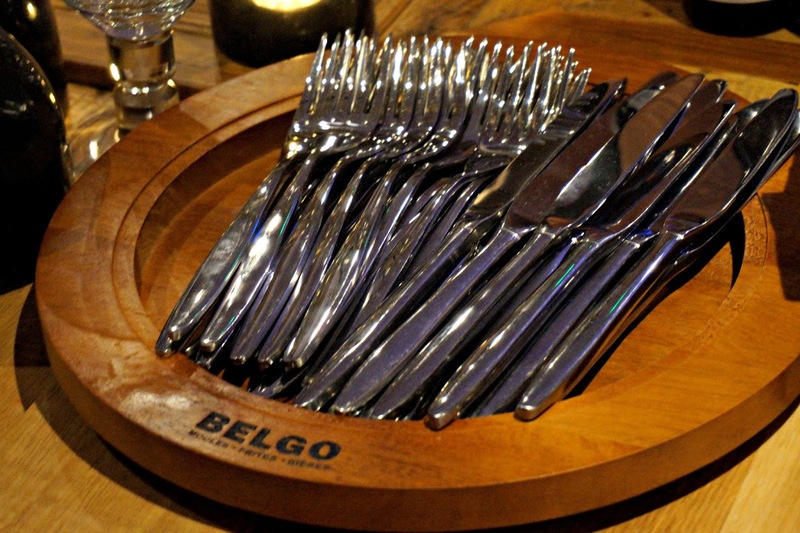 As you might have guessd by the name, Belgo is inspired by Belgium. 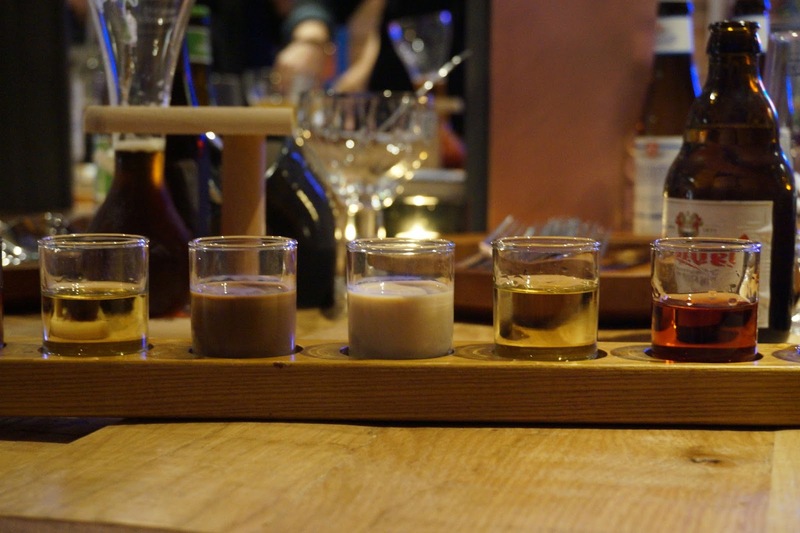 They've been open since 1992 but the brand decided it needed a face-lift so set about changing the direction it was taking Belgian inspired food in London and invited a group of bloggers down to show what they had been up to. Now what is Belgium famous for? Beer of course. 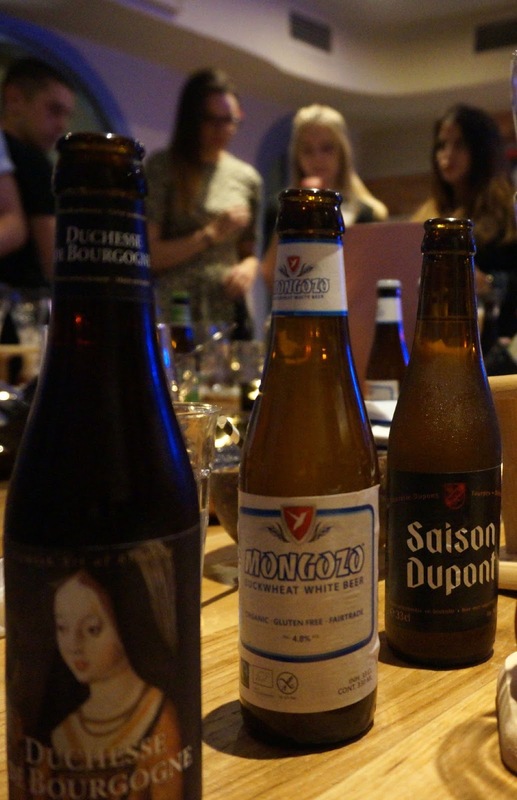 So it only made sense that we would have a tasting evening of the new menu all accompanied by their perfect partnering beer! Belgo are big on drink. They want you to feel that this is a place you can come for a pint as much as for a bite to eat. 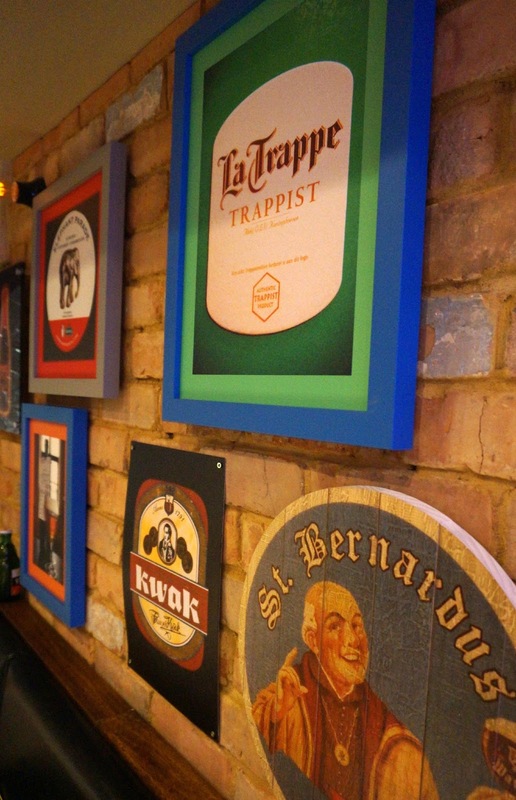 And as they boast an offering of over 50 different craft beers, everyone is bound to find something suited to them. 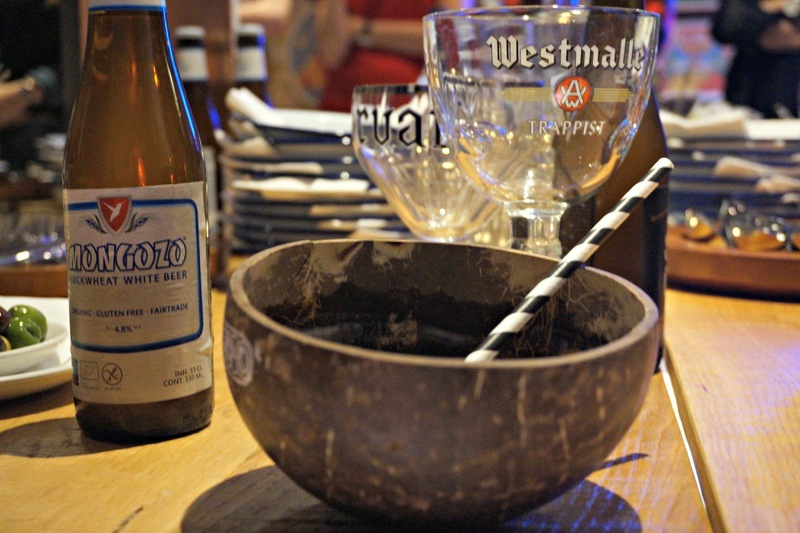 On arrival we were offered a 'Mongozo' - a coconut flavoured beer served out of a real coconut shell! I'm sure even the non-beer drinkers out there have got to be impressed with that! I managed to find myself an excellent eating partner in the beautiful Sophie of A Story of a Girl (make sure you check out her blog!) 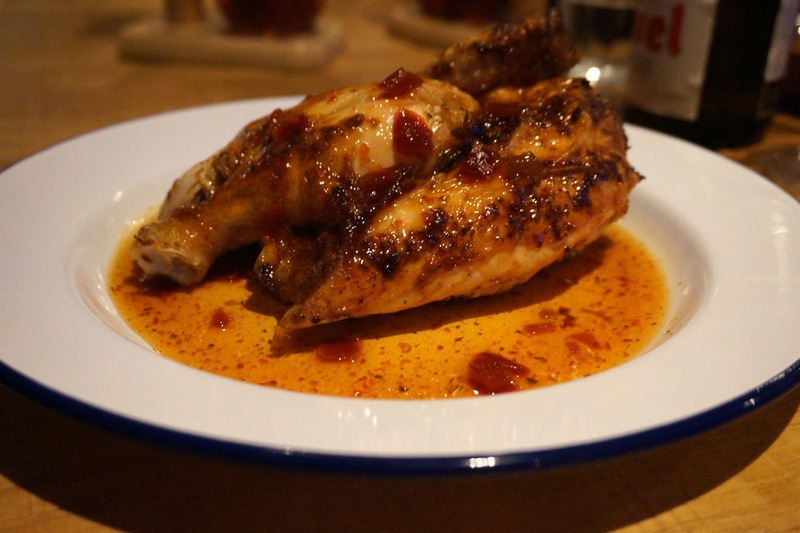 and together we set about exploring our way through the majority of Belgo's signature dishes. We started of course with the moules. Belgo is renowned for its mussels, all of which are sourced from the Shetland islands and rope grown, grit free and very sustainable. There are 10 different variations on the menu. We tried the kimchee flavour (£13.50) which were served in a Korean style hot & spicy sauce finished with pak choi - perfectly cooked with a punch of spice. Next was Lobster. I had no idea Belgo did lobster so my face lit up when I saw their big red claws making their way down the stairs to our table. 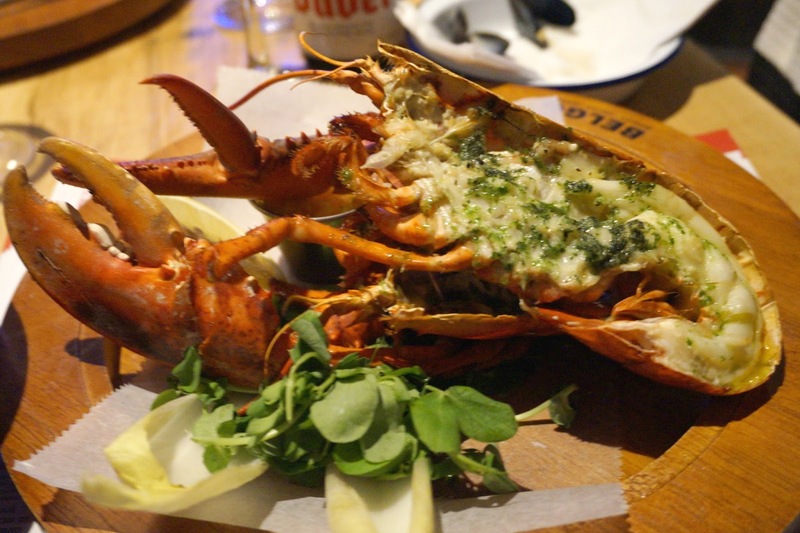 All of Belgo's lobsters are delivered fresh and you can get a whole lobster with garlic butter, homemade coleslaw and fries for just over £30. Not quite as cheap as Burger and Lobster but they taste amazing. 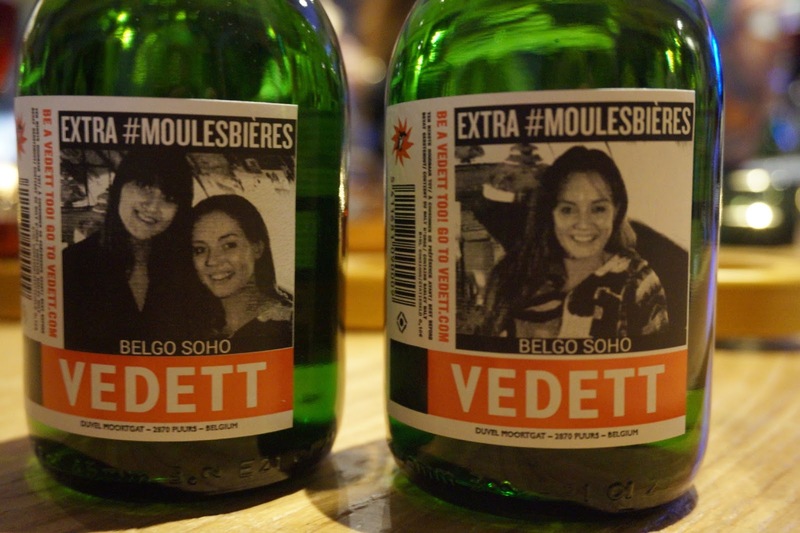 The lovely people at Vedett even put mine & Sophie's face on a bottle of the stuff! Dessert could be non other than Belgian waffles (£5.50). 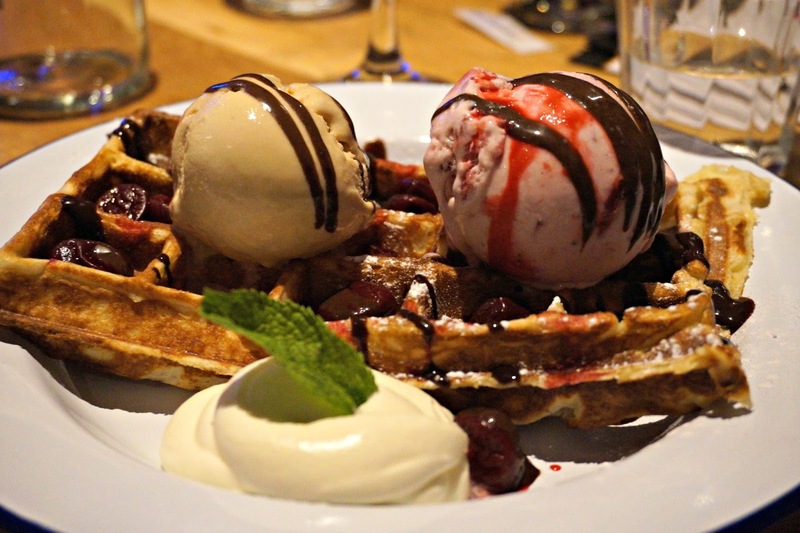 Belgo let you personalise your waffles with your choice of sauce and ice cream. 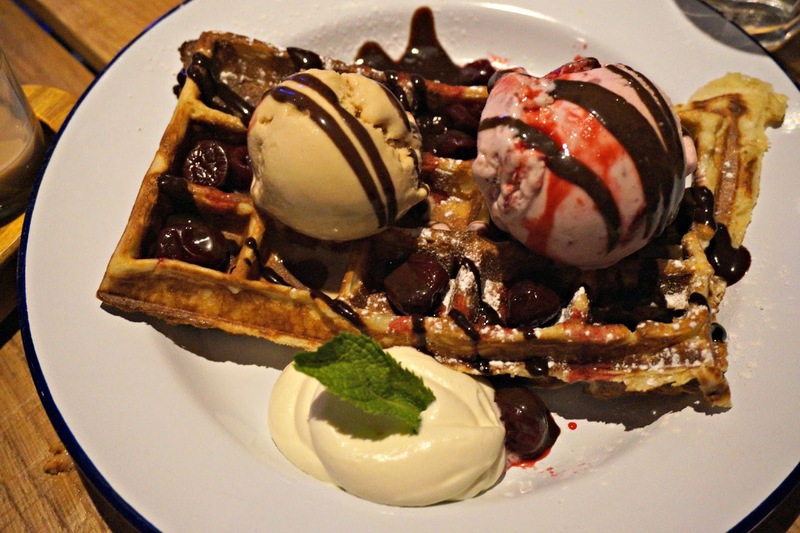 If you order the cherries coulis with strawberry ice cream and chocolate sauce - i promise you won't be disappointed! You might remember I said Belgo wanted to be somewhere you could come to drink - and they meant it. If you let them, they are willing to ply you with their Schnapps shots sticks. 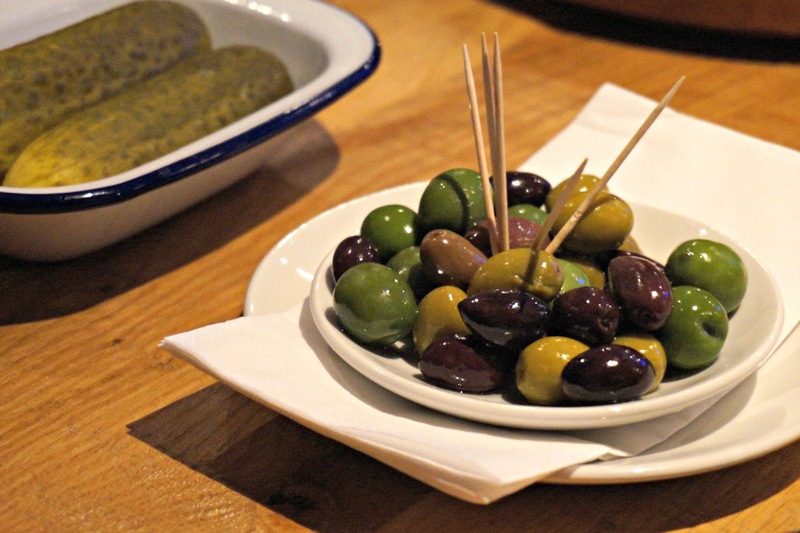 I resisted and only tried one (it was a Tuesday god dammit) but if you're looking fora boozy evening they are well worth a go!